Ash Hill has a long and established history in the heart of South Central Ireland. If you are looking for a luxury Bed and Breakfast accommodation in Limerick then you have found something special right here. 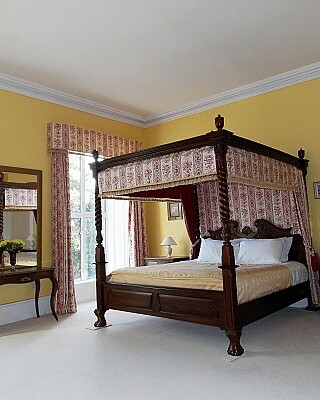 Set in a large, wooded estate, Ash Hill has been lovingly restored with attention to detail. With original Adam’s and Gothic style stucco throughout the house, visitors can appreciate old world craftsmanship rarely seen today. Several of the guest bedrooms have original works on the ceilings and can be enjoyed at leisure. Whether your interests are formal or casual, all the rooms at Ash Hill are spacious and comfortable and most guests find that “special something” they are looking for. Meals are sourced at Ash Hill and locally, unless by special request. Cattle, sheep and geese are but of a few of the animals you will find here as well as seasonal fruits, vegetables and a large variety of herbs. Though Ash Hill dates from circa 1780 as the Evans family home, the estate itself was originally a part of Castle Coote. Castle Coote has long since disappeared into the annals of history, however the remains of its exterior wall and arched entry can still be seen at Ash Hill. While exploring the wall visitors will see a Neolithic burial mound thought to be that of a Chieftain. In more recent history the manor was used to house troops and prisoners in the Irish civil war, and drawings from both can still be seen on the walls of the third floor. Guests are encouraged to explore and enjoy everything Ash Hill has to offer.